Competitive Advantage Quote. Media’s industry advantage results from innovative, unique and proprietary technologies. Our company has extensive experience in data and content provisioning, and has developed a strong reputation for professionalism and customer satisfaction among its customers, and across the financial industry. We are known for our agility and our ability to say yes when clients need something custom or unique. Our advanced technologies are incorporated throughout our product lines: low latency streaming data feeds, XML and JSON data services, proprietary QMod web delivery systems and script libraries, as well as our Quotestream suite of desktop and mobile applications. All of the above, combined with acute responsiveness to the needs of the financial marketplace, are factors that set us apart from other data providers and establish Quote. Media as the data provider of choice. Quote. Media is established as a leading aggregator and provider of comprehensive market data and research information, fundamentals, analysis, charting, alerts, news, filings, ratings, ownership, institutional holdings, financials, earnings, historical data, tick data and much more. Quote. Media also possesses the capabilities to load and integrate additional data directly from clients, or from third party providers, aggregating information to provide the best solution to our clients’ customers. Quote. Media is Vendor of Record for all trade data from the exchanges. In addition, Quote. 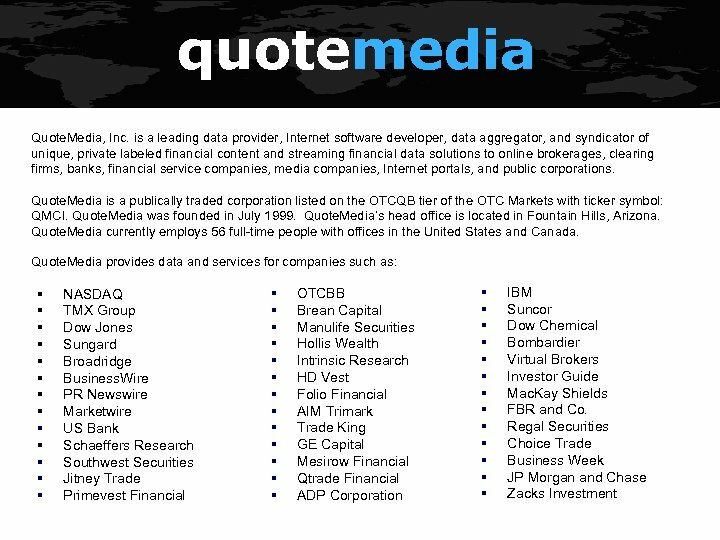 Media has relationships with not only the exchanges, but also top tier data and research providers such as Zacks Investment Research, Morningstar, Fundata, Lipper, Exchange Data International, Dow Jones, Mergent, Econoday, SEDI, Standard & Poors, Wall Street Horizon, Baystreet. ca, all the newswires, and many others. quotemedia Market Data Feeds Comprehensive, ultra-low latency, tick-by-tick enterprise level streaming market data solutions. Quote. 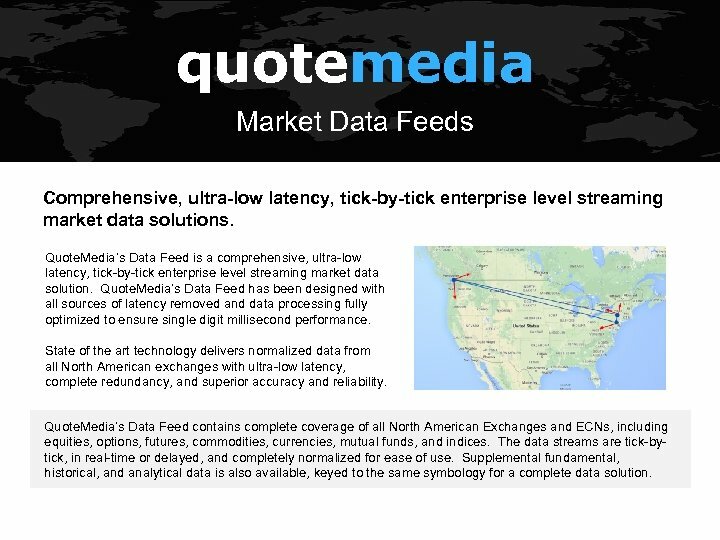 Media’s Data Feed is a comprehensive, ultra-low latency, tick-by-tick enterprise level streaming market data solution. Quote. Media’s Data Feed has been designed with all sources of latency removed and data processing fully optimized to ensure single digit millisecond performance. State of the art technology delivers normalized data from all North American exchanges with ultra-low latency, complete redundancy, and superior accuracy and reliability. Quote. 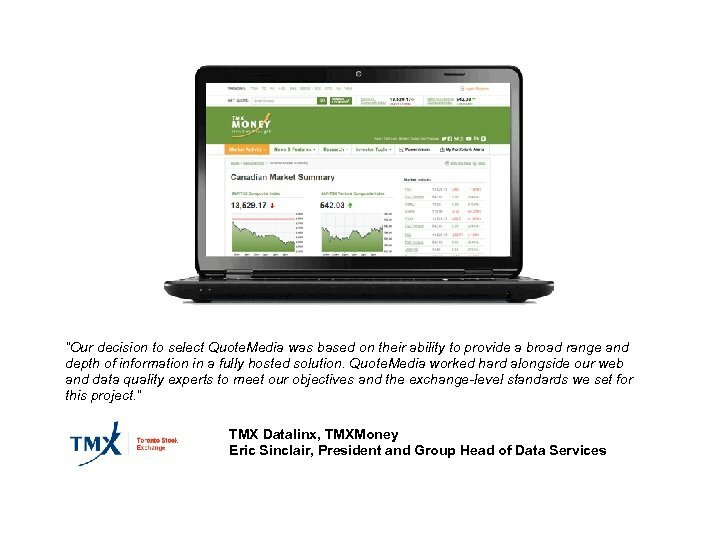 Media’s Data Feed contains complete coverage of all North American Exchanges and ECNs, including equities, options, futures, commodities, currencies, mutual funds, and indices. The data streams are tick-bytick, in real-time or delayed, and completely normalized for ease of use. Supplemental fundamental, historical, and analytical data is also available, keyed to the same symbology for a complete data solution. 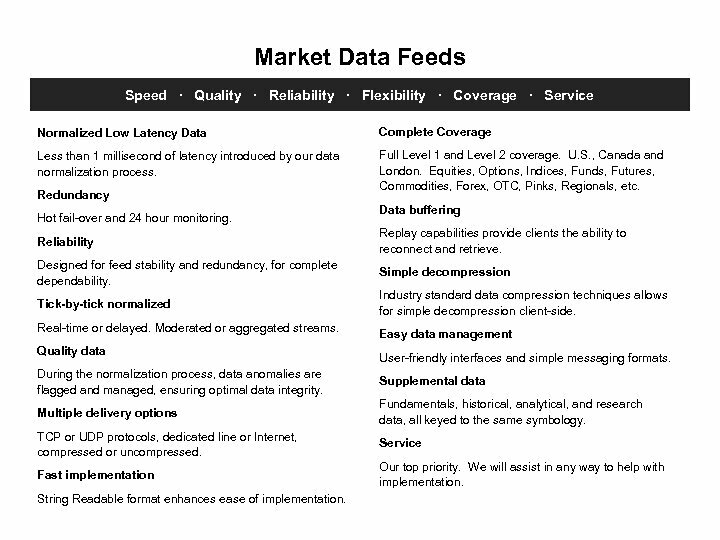 Market Data Feeds Speed ∙ Quality ∙ Reliability ∙ Flexibility ∙ Coverage ∙ Service Normalized Low Latency Data Complete Coverage Less than 1 millisecond of latency introduced by our data normalization process. Full Level 1 and Level 2 coverage. U. S. , Canada and London. Equities, Options, Indices, Funds, Futures, Commodities, Forex, OTC, Pinks, Regionals, etc. Redundancy Hot fail-over and 24 hour monitoring. Data buffering Reliability Replay capabilities provide clients the ability to reconnect and retrieve. Designed for feed stability and redundancy, for complete dependability. Simple decompression Tick-by-tick normalized Industry standard data compression techniques allows for simple decompression client-side. Real-time or delayed. Moderated or aggregated streams. Quality data Easy data management User-friendly interfaces and simple messaging formats. During the normalization process, data anomalies are flagged and managed, ensuring optimal data integrity. Supplemental data Multiple delivery options Fundamentals, historical, analytical, and research data, all keyed to the same symbology. TCP or UDP protocols, dedicated line or Internet, compressed or uncompressed. Service Fast implementation Our top priority. We will assist in any way to help with implementation. String Readable format enhances ease of implementation. "The timeliness, immediacy and reliability of our data provider are absolutely critical. We tested several data feeds extensively, and chose Quote. Media because of their proven performance and the coverage and depth of their data. They have everything we were looking for. Quotemedia have been extremely responsive to our requests, and they worked closely with us to make any development-related changes that we required. " "We have been extremely impressed with Quote. Media. The seamless integration of Quote. 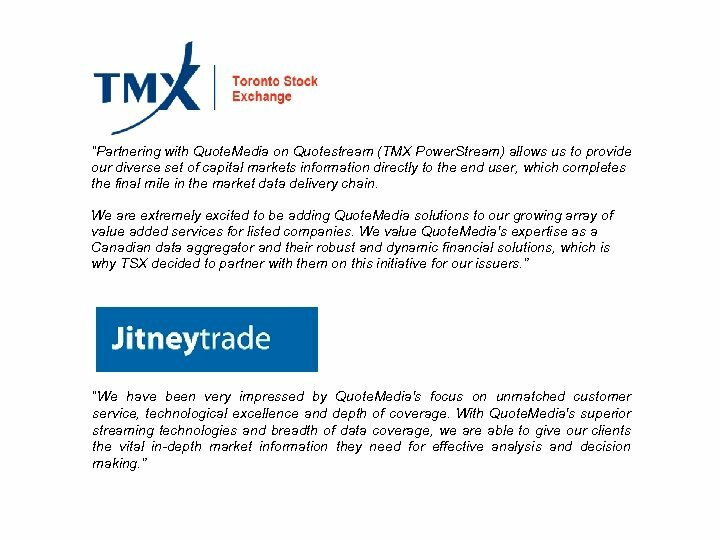 Media's technologies into our trading platform enhanced our client offerings instantly. We are committed to providing our clients with the best possible trading technologies, and Quote. Media's innovative solutions have enabled us to continue toward this goal. " 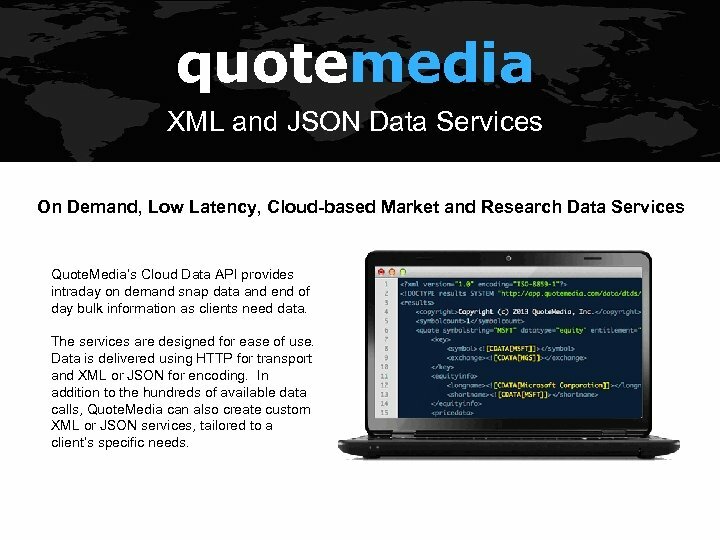 quotemedia XML and JSON Data Services On Demand, Low Latency, Cloud-based Market and Research Data Services Quote. 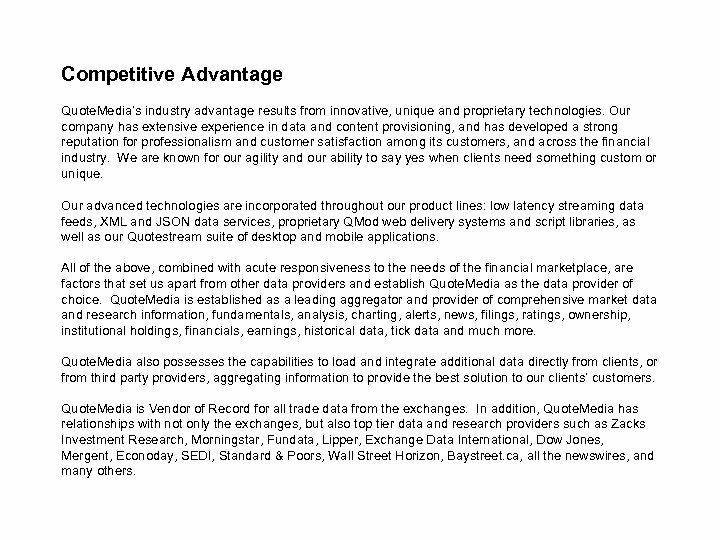 Media’s Cloud Data API provides intraday on demand snap data and end of day bulk information as clients need data. The services are designed for ease of use. Data is delivered using HTTP for transport and XML or JSON for encoding. In addition to the hundreds of available data calls, Quote. 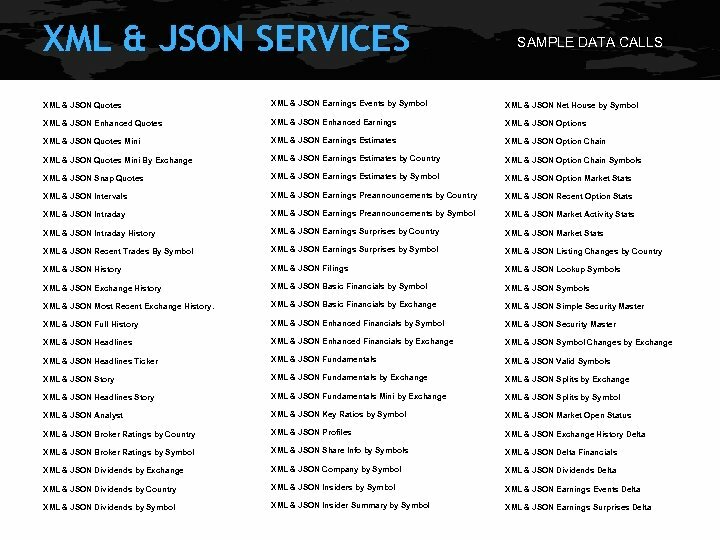 Media can also create custom XML or JSON services, tailored to a client’s specific needs. 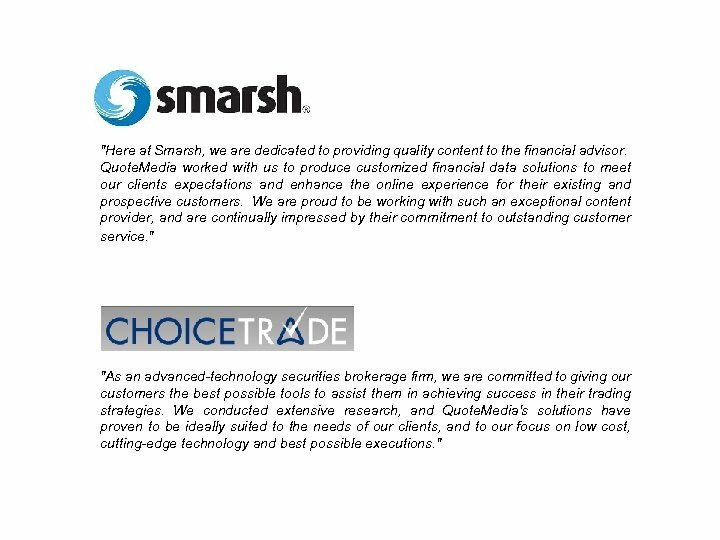 "Here at Smarsh, we are dedicated to providing quality content to the financial advisor. Quote. 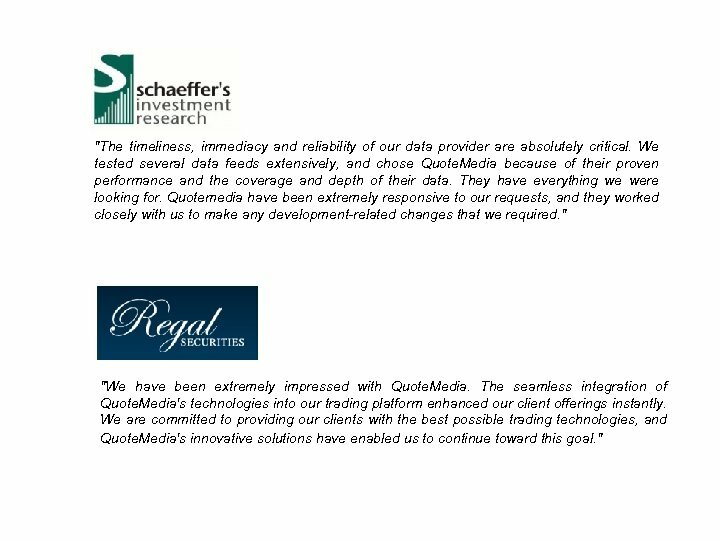 Media worked with us to produce customized financial data solutions to meet our clients expectations and enhance the online experience for their existing and prospective customers. We are proud to be working with such an exceptional content provider, and are continually impressed by their commitment to outstanding customer service. " 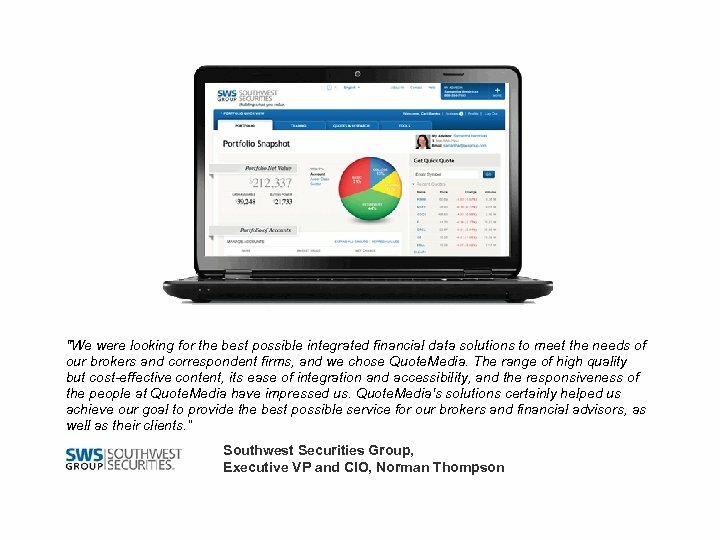 "As an advanced-technology securities brokerage firm, we are committed to giving our customers the best possible tools to assist them in achieving success in their trading strategies. We conducted extensive research, and Quote. Media's solutions have proven to be ideally suited to the needs of our clients, and to our focus on low cost, cutting-edge technology and best possible executions. " 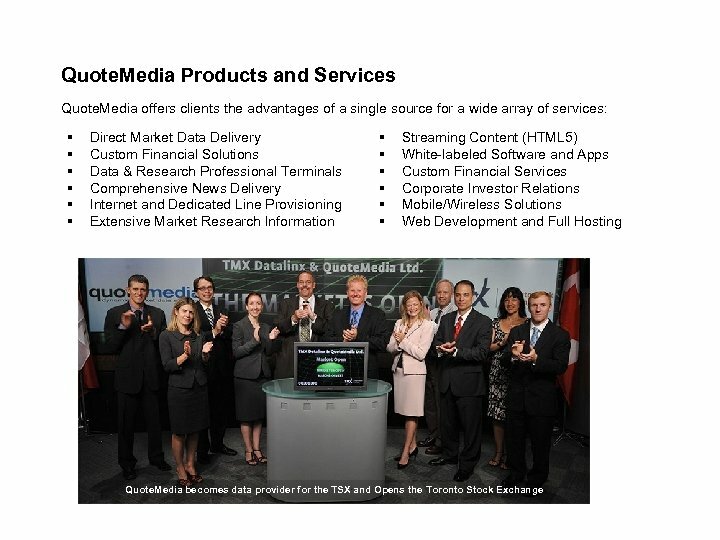 quotemedia Web Content Solutions Dynamic Web Content Services Quote. Media provides an extensive array of dynamic financial information that can be seamlessly integrated into websites and web applications. 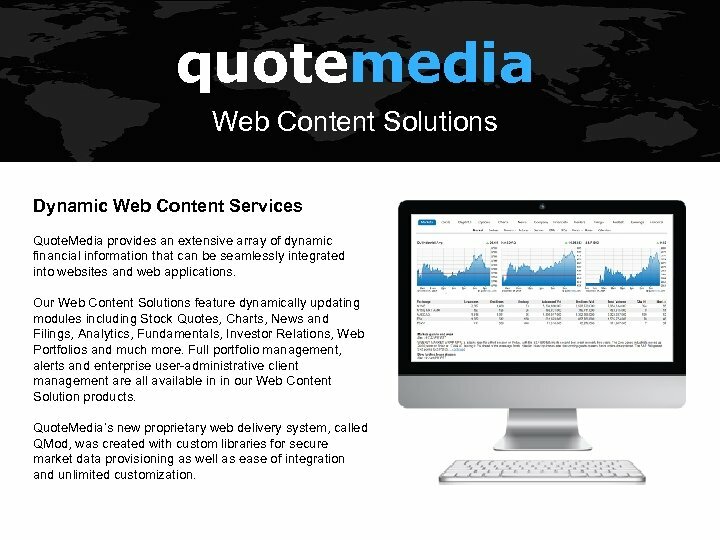 Our Web Content Solutions feature dynamically updating modules including Stock Quotes, Charts, News and Filings, Analytics, Fundamentals, Investor Relations, Web Portfolios and much more. Full portfolio management, alerts and enterprise user-administrative client management are all available in in our Web Content Solution products. Quote. 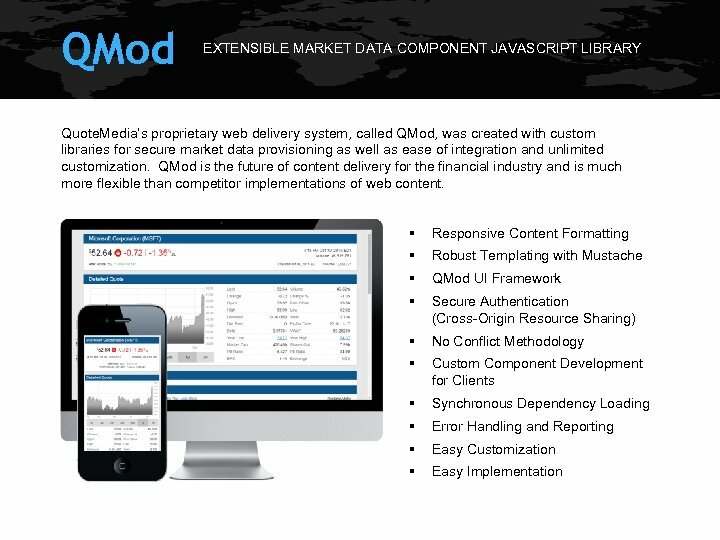 Media’s new proprietary web delivery system, called QMod, was created with custom libraries for secure market data provisioning as well as ease of integration and unlimited customization. 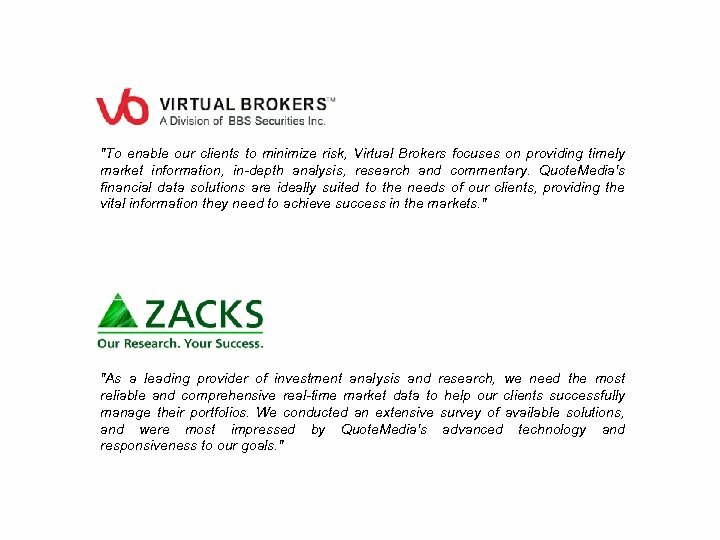 "To enable our clients to minimize risk, Virtual Brokers focuses on providing timely market information, in-depth analysis, research and commentary. Quote. Media's financial data solutions are ideally suited to the needs of our clients, providing the vital information they need to achieve success in the markets. " "As a leading provider of investment analysis and research, we need the most reliable and comprehensive real-time market data to help our clients successfully manage their portfolios. We conducted an extensive survey of available solutions, and were most impressed by Quote. Media's advanced technology and responsiveness to our goals. " "At FFEC, it is vital that we stay up to date on market circumstances, economic issues and investment strategies, to insure that decisions we make on our clients' behalf are made in the framework of current conditions. By providing comprehensive up-to-the-second market data and research information, Quote. Media's applications deliver the best possible information for our brokers to properly serve our diverse clientele. " 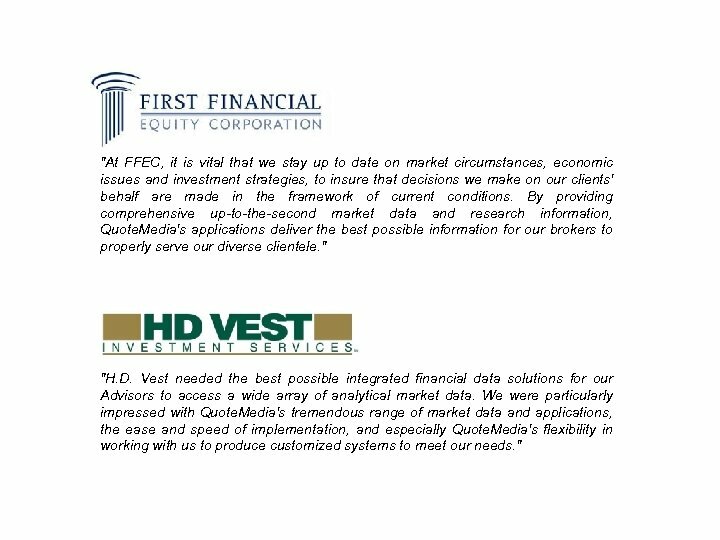 "H. D. Vest needed the best possible integrated financial data solutions for our Advisors to access a wide array of analytical market data. We were particularly impressed with Quote. Media's tremendous range of market data and applications, the ease and speed of implementation, and especially Quote. Media's flexibility in working with us to produce customized systems to meet our needs. " 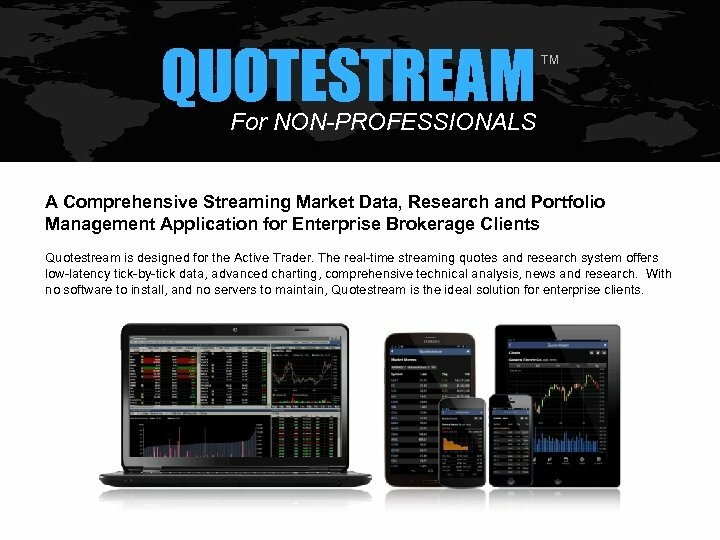 QUOTESTREAM TM For NON-PROFESSIONALS A Comprehensive Streaming Market Data, Research and Portfolio Management Application for Enterprise Brokerage Clients Quotestream is designed for the Active Trader. The real-time streaming quotes and research system offers low-latency tick-by-tick data, advanced charting, comprehensive technical analysis, news and research. 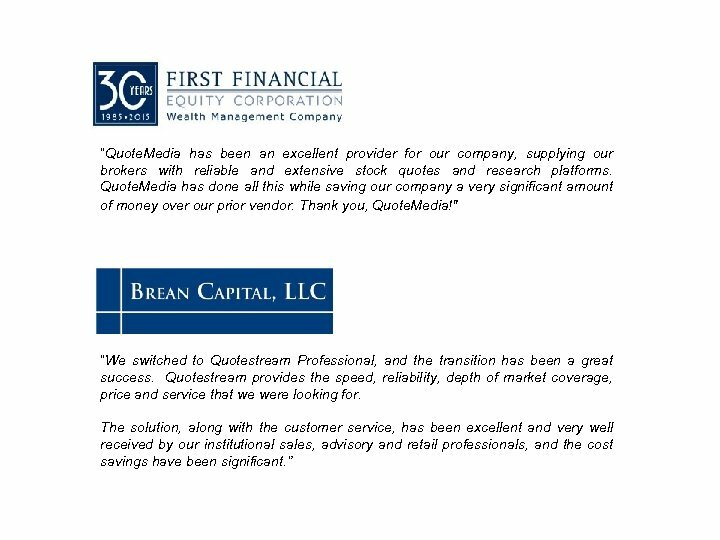 With no software to install, and no servers to maintain, Quotestream is the ideal solution for enterprise clients. “Our exhaustive search for the best provider of integrated financial content and streaming financial data solutions for our clients led us directly to Quote. 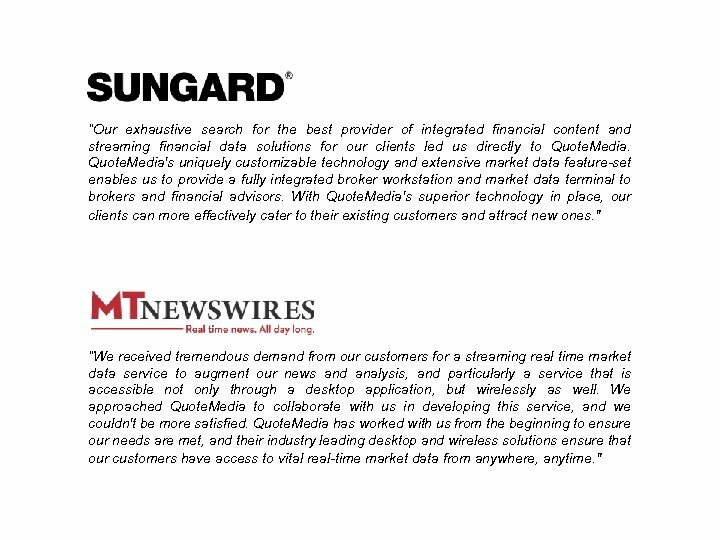 Media's uniquely customizable technology and extensive market data feature-set enables us to provide a fully integrated broker workstation and market data terminal to brokers and financial advisors. With Quote. Media's superior technology in place, our clients can more effectively cater to their existing customers and attract new ones. " “We received tremendous demand from our customers for a streaming real time market data service to augment our news and analysis, and particularly a service that is accessible not only through a desktop application, but wirelessly as well. We approached Quote. Media to collaborate with us in developing this service, and we couldn't be more satisfied. Quote. Media has worked with us from the beginning to ensure our needs are met, and their industry leading desktop and wireless solutions ensure that our customers have access to vital real-time market data from anywhere, anytime. " "People are increasingly relying on mobile devices to keep them connected to important information and services, from sending and receiving business email, finding restaurants, and tracking diets to receiving personal financial alerts like stock market data. Partners like Quote. Media take people beyond email and business productivity on their device to a complete experience for their work and personal lives. 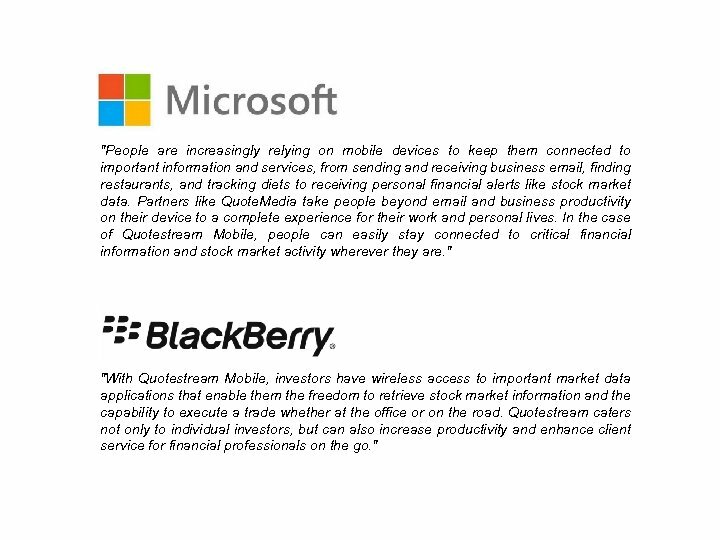 In the case of Quotestream Mobile, people can easily stay connected to critical financial information and stock market activity wherever they are. " 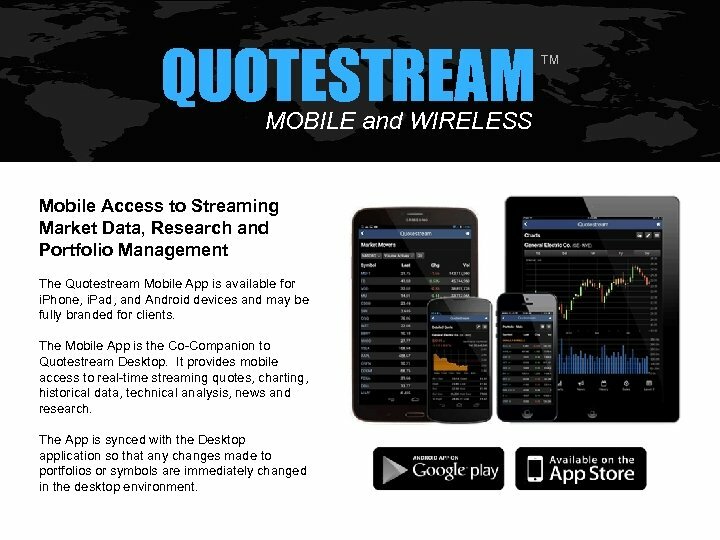 "With Quotestream Mobile, investors have wireless access to important market data applications that enable them the freedom to retrieve stock market information and the capability to execute a trade whether at the office or on the road. 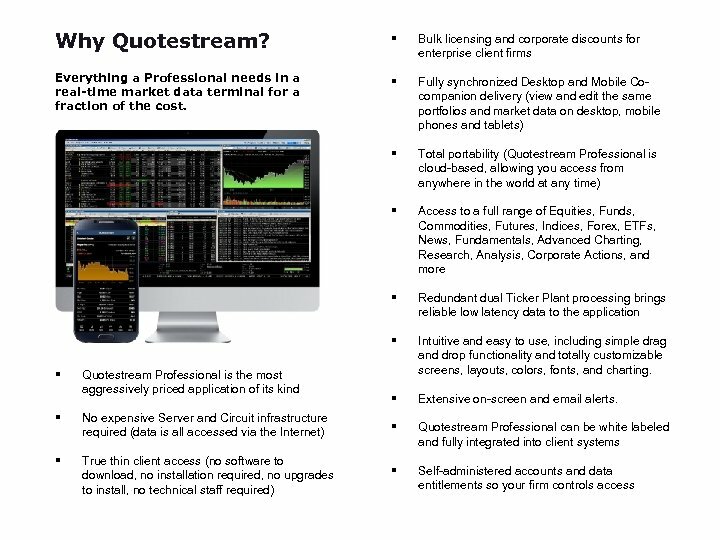 Quotestream caters not only to individual investors, but can also increase productivity and enhance client service for financial professionals on the go. " 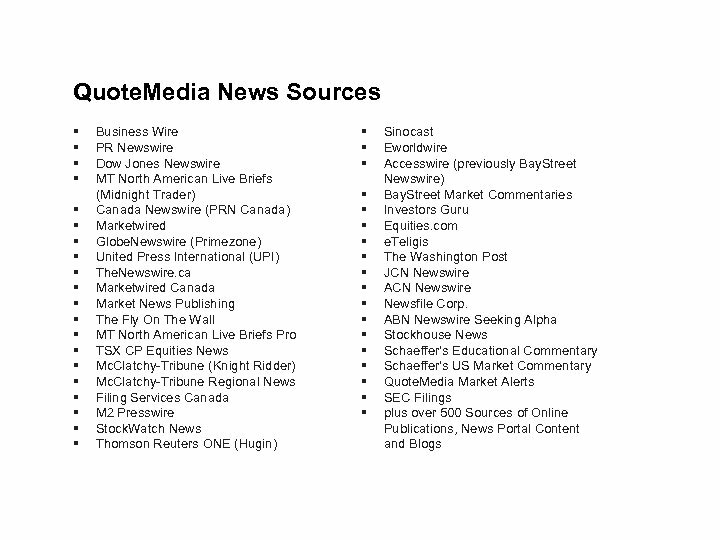 quotemedia News Feeds Comprehensive, Reliable, Relevant Real-time News Services Quote. Media delivers news of the most respected publishers in the world. Sources include Dow Jones, Midnight Trader, PR Newswire, Business Wire, Seeking. Alpha, Canada News. Wire, Stock. 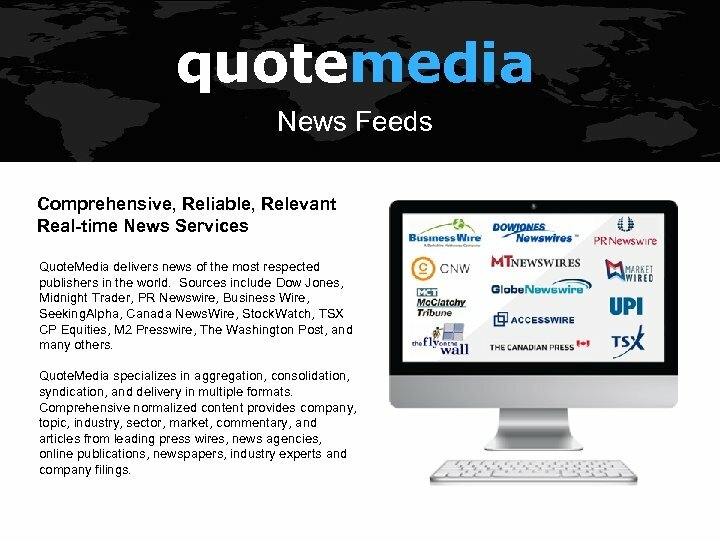 Watch, TSX CP Equities, M 2 Presswire, The Washington Post, and many others. Quote. Media specializes in aggregation, consolidation, syndication, and delivery in multiple formats. Comprehensive normalized content provides company, topic, industry, sector, market, commentary, and articles from leading press wires, news agencies, online publications, newspapers, industry experts and company filings. 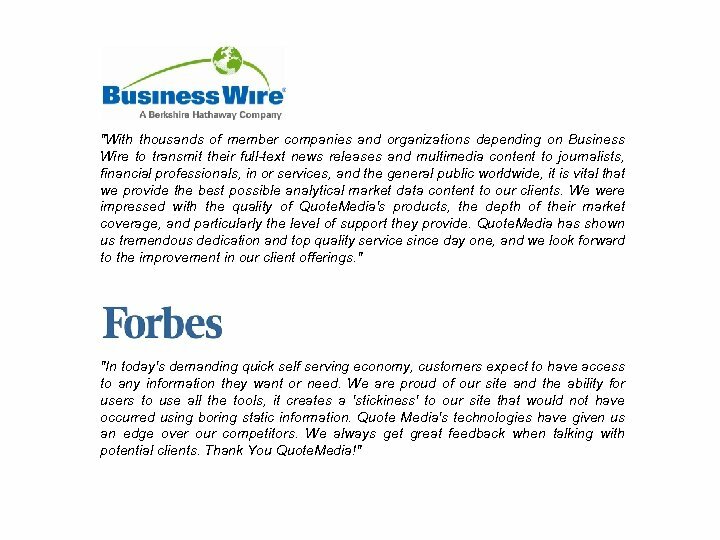 "With thousands of member companies and organizations depending on Business Wire to transmit their full-text news releases and multimedia content to journalists, financial professionals, in or services, and the general public worldwide, it is vital that we provide the best possible analytical market data content to our clients. We were impressed with the quality of Quote. Media's products, the depth of their market coverage, and particularly the level of support they provide. Quote. Media has shown us tremendous dedication and top quality service since day one, and we look forward to the improvement in our client offerings. " "In today's demanding quick self serving economy, customers expect to have access to any information they want or need. We are proud of our site and the ability for users to use all the tools, it creates a 'stickiness' to our site that would not have occurred using boring static information. Quote Media's technologies have given us an edge over our competitors. We always get great feedback when talking with potential clients. Thank You Quote. Media!" "With our core market of business professionals across North America, it is vital that we continue to execute our strategy of providing 'Best in Class' programming to our viewers. Quote. 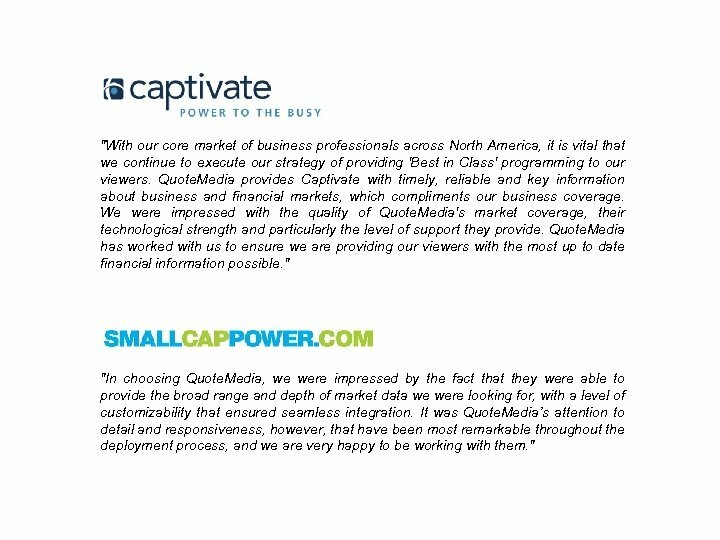 Media provides Captivate with timely, reliable and key information about business and financial markets, which compliments our business coverage. We were impressed with the quality of Quote. Media's market coverage, their technological strength and particularly the level of support they provide. Quote. Media has worked with us to ensure we are providing our viewers with the most up to date financial information possible. " "In choosing Quote. Media, we were impressed by the fact that they were able to provide the broad range and depth of market data we were looking for, with a level of customizability that ensured seamless integration. It was Quote. Media’s attention to detail and responsiveness, however, that have been most remarkable throughout the deployment process, and we are very happy to be working with them. " "Customers are demanding more. The addition of Quote. 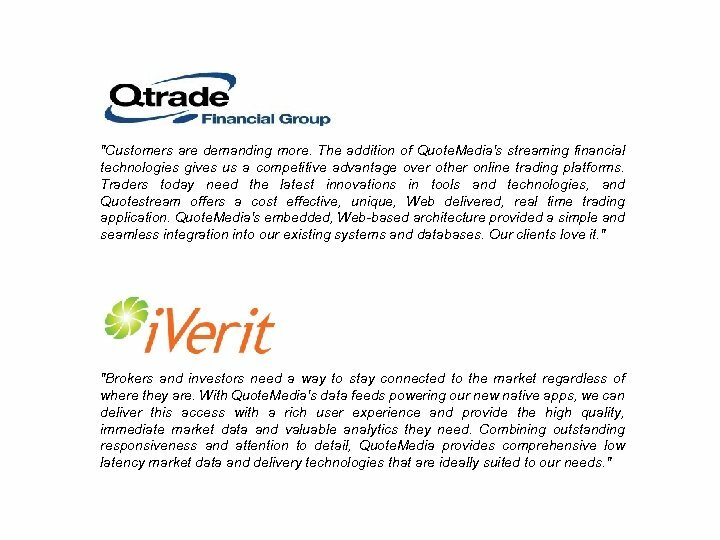 Media's streaming financial technologies gives us a competitive advantage over other online trading platforms. 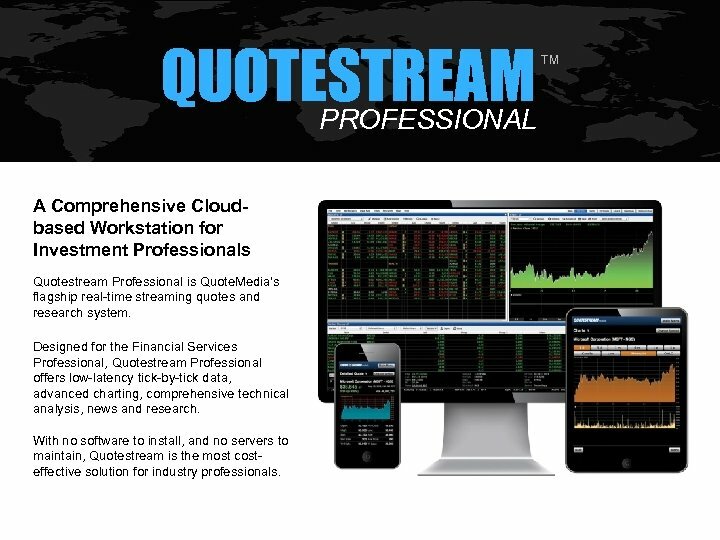 Traders today need the latest innovations in tools and technologies, and Quotestream offers a cost effective, unique, Web delivered, real time trading application. Quote. Media's embedded, Web-based architecture provided a simple and seamless integration into our existing systems and databases. Our clients love it. " "Brokers and investors need a way to stay connected to the market regardless of where they are. With Quote. Media's data feeds powering our new native apps, we can deliver this access with a rich user experience and provide the high quality, immediate market data and valuable analytics they need. Combining outstanding responsiveness and attention to detail, Quote. Media provides comprehensive low latency market data and delivery technologies that are ideally suited to our needs. "